We are midway through another exciting Wimbledon tennis tournament and so this week’s poster is Wimbledon by Andrew Power, the pseudonym of Sybil Andrews. The English born Canadian artist wanted to acknowledge her studio partner Cyril Power to show gratitude for his help in securing her work from London Transport. 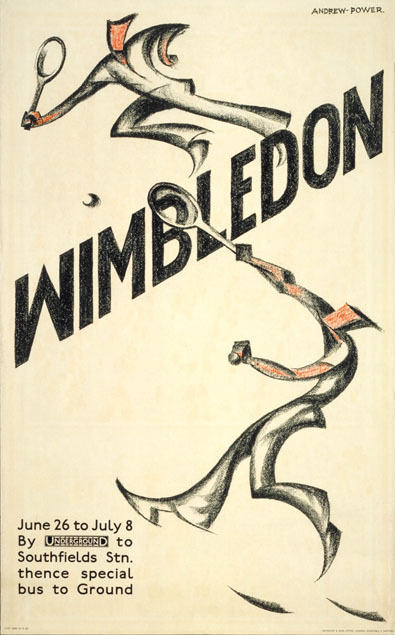 The poster was produced in 1933 and was one of two that year advertising the Wimbledon Championships with the other poster in a different style in order to appeal to a broad audience. Wimbledon tennis tournament is the longest running in the world and has been held at the All England Club since 1877. It is one of the four major world tournaments, or grand slams, which offer the highest prize money and ranking points out of all tournaments. Wimbledon is the only major tournament still played on grass, the original playing surface of the game, and attracts the top players from over 60 countries. Much has changed throughout the tournament’s long history. There were only 200 spectators at the first Wimbledon tournament and tickets were sold for one shilling each. Nowadays there are just shy of half a million spectators each year with the most expensive tickets priced at £130. Accordingly the prize money has also significantly increased. When Billie Jean King won in the 1960s she received a £25 gift voucher, whereas both the male and female winners now receive £1,150,000 each. The All England Club has also witnessed some dramatic events in its time. During World War II a bomb ripped through Centre Court demolishing 1,200 seats which fortunately had already been vacated. In recent years the courts hosted the longest tennis match in history. American John Isner and Frenchman Nicolas Mahut played for 11 hours and 5 minutes across three days in 2010. The match was won by Isner 6-4, 3-6, 6-7 (7), 7-6 (3), 70-68. The modernist style of this Wimbledon advertising poster was typical of Sybil Andrews who was internationally acclaimed for her printmaking. She trained in England during the First World War where she specialised in lino cutting, but also contributed to the war effort working as a welder in an aircraft factory. During World War II she worked in the shipyards of Southampton where she also met her future husband with whom she moved to Canada following the war. Here she had a very successful career producing her own works and teaching and passed away at the age of 94 in 1992. Have you seen our NEW Wimbledon Poster for 2013?